The trucks are coming! The trucks are coming! The spark of an idea on a grassroots website has set alight a nationwide bushfire of protest. Australians, of different political views, who share a sense of revulsion against our rogue government have united to support a national protest using typically and emotionally Australian symbolism. In two weeks big trucks will be leading road trains of vehicles from all across the nation to Canberra as “Convoys of No Confidence” in the government. From the coasts and rivers, through the mountain ranges, deserts, the towns, the cities the convoys will be carrying with them ordinary Australians who want to make known the lack of confidence they feel in an incompetent Gillard-Brown government whose foundations, many say, are based on a lie by the Prime Minister. Organised by Cate Stuart, Mick Pattel and the board of the National Road Freighters Association, a good idea on a small grassroots internet site has grown into eleven truck led convoys setting out to Canberra to stage a joint protest of “No Confidence” in the government . 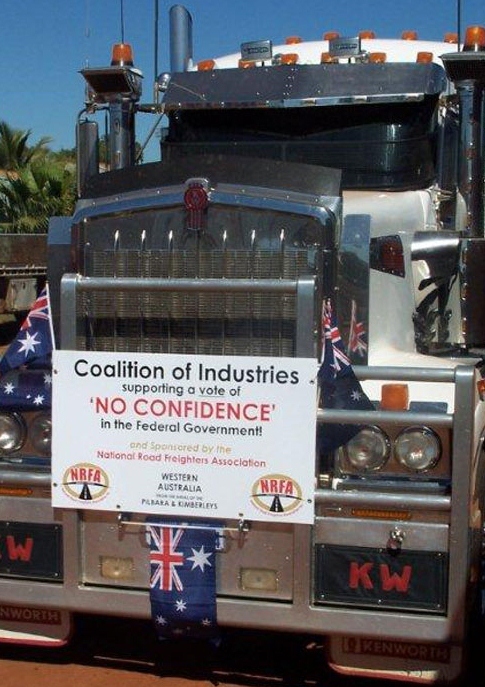 With the first convoy due to set out from Port Hedland on Tuesday 16 August the rendezvous of “A Convoy of No Confidence” will be in the capital on Monday 22 August. From the 16th onwards other convoys will be leaving from Atherton, Rockhampton, Brisbane (2 convoys), Perth, Adelaide, Warragul, Mildura, and Bendigo and will be joined by protest vehicles along the route. An extraordinary grassroots rebellion by ordinary, ignored Australians is underway and we wish them well.